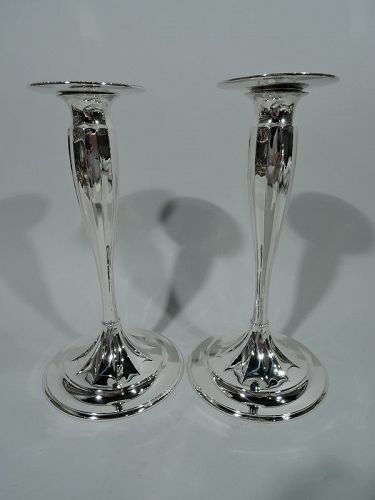 Pair of sterling silver candlesticks. Made by Tiffany & Co. in New York. Each: Fluted tapering shaft terminating in raised and fluted star on round and raised foot. Beaded knop at base. Detachable bobeche same. Hallmark includes pattern no. 12221 (first produced in 1895) and director’s letter T (1892-1902). Very good condition. 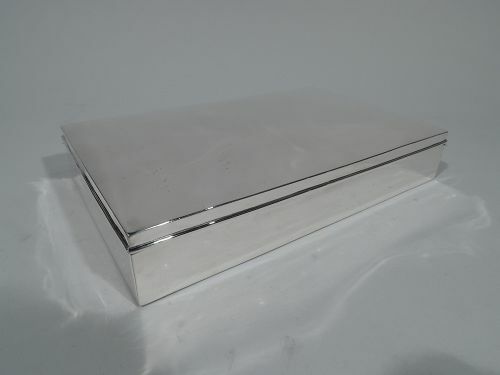 Classic sterling silver desk box. Made by Tiffany & Co. in New York, ca 1913. Rectangular with straight sides. Cover hinged and gently curved with molded rim. Hallmark includes pattern no. 18496 (first produced in 1913) and director’s letter m (1907-47). Very good condition. 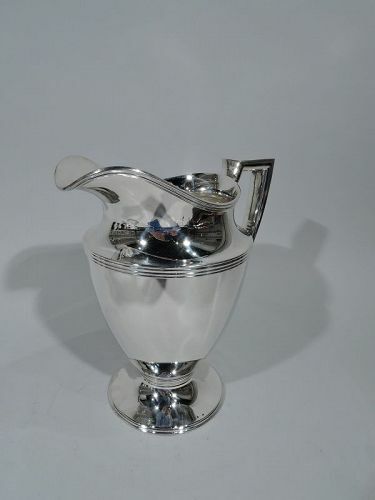 Classic sterling silver water pitcher. Made by Tiffany & Co. in New York. Curved and tapering body, raised and stepped foot, scrolled bracket handle, and helmet mouth. Ornamental reeding. Fully marked including pattern no. 18181, director’s letter M (1947-56), and volume (4 pints). Very good condition. 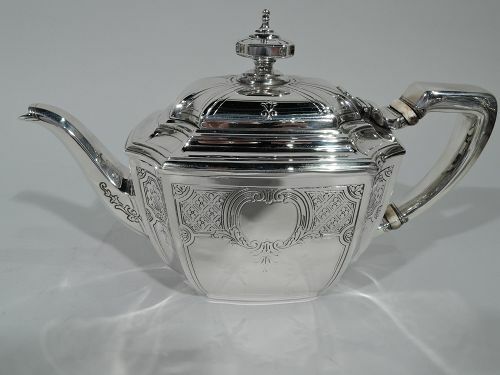 Art Deco sterling silver coffee and tea set in Hampton pattern with engraved ornament. 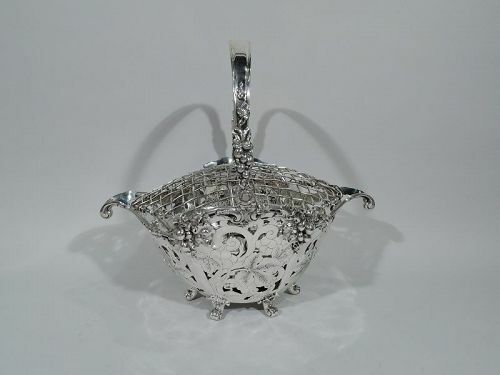 Made by Tiffany & Co. in New York, ca 1920. 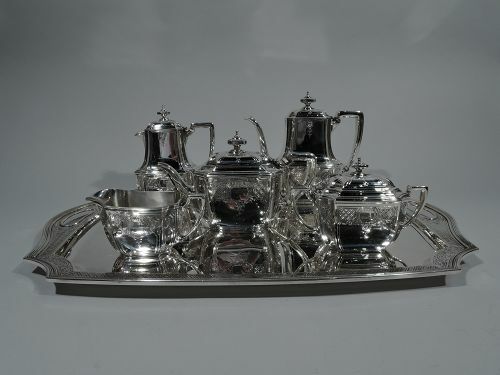 This set comprises coffeepot, teapot, hot water pot, creamer, and sugar on tray. 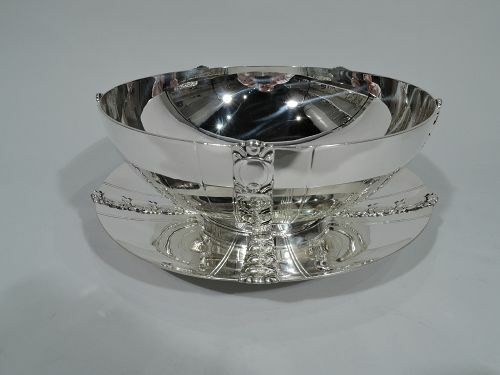 Art Deco sterling silver bowl on stand with tomato motif. Made by Tiffany & Co. in New York. Bowl: Curved sides and short foot. Stand: Round and curved with short foot. Ornament in form of applied vertical pilasters with imbricated tomatoes between incised bands. Hallmarks includes director’s letter m (1907-47), wartime star (1943-45), and pattern nos. 22888 (bowl) and 22565 (stand). Very good condition. 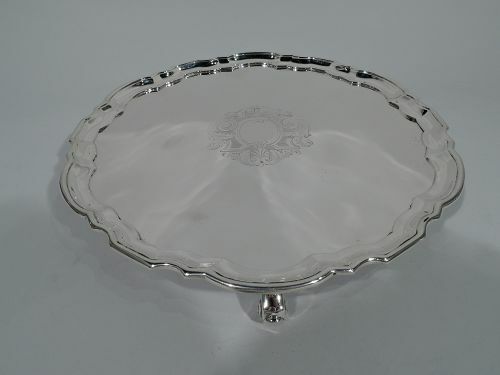 Traditional sterling silver salver. 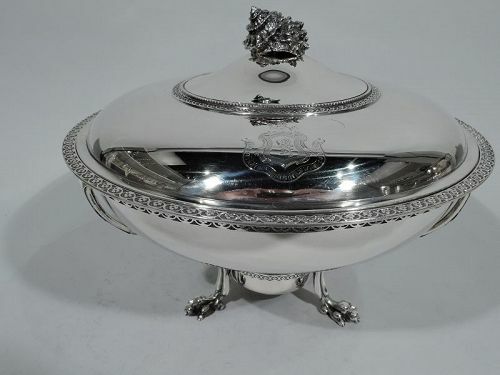 Made by Tiffany & Co. in New York, ca 1931. Circular with molded curvilinear piecrust rim. Scrolled frame (vacant) with fancy leaf-and-scroll surround engraved in well center. Rests on 4 capped volute scroll supports. Long live Georgian! Hallmark includes pattern no. 21743 (first produced in 1931) and director’s letter m (1907-47). Very good condition. 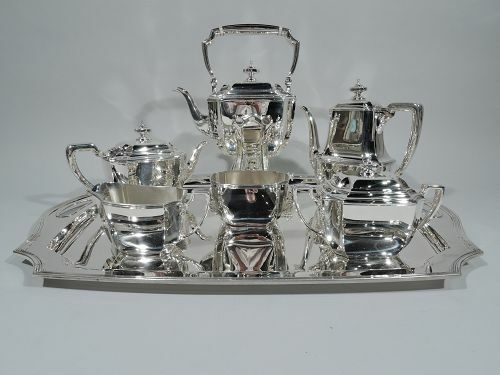 Art Deco sterling silver coffee and tea set on tray in classic Hampton pattern. 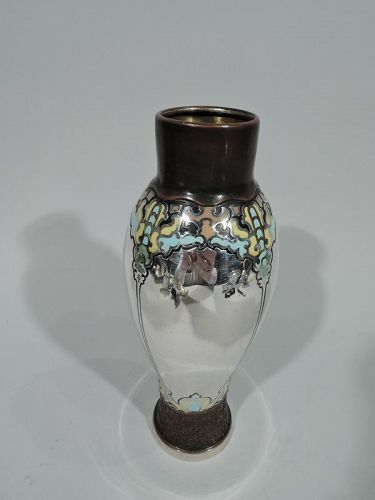 Made by Tiffany & Co. in New York, ca 1920. This set comprises hot water kettle on stand, coffeepot, teapot, creamer, sugar, and waste bowl on tray. 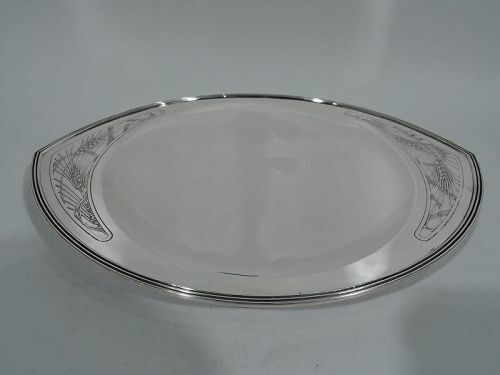 Art Deco sterling silver bread tray. Made by Tiffany & Co. in New York. Pointed oval with round shallow bowl. Ends have shaped frames with acid-etched and stylized grain heads and stalks. A stylish and wholesome addition to the dinner table. Hallmark includes pattern no. 18750A (first produced in 1914) and director’s letter m 1907-47). Excellent condition.